This is an excellent video of a KNPV certification. "Johnny Ulrich managed to certify Jochie with 424 points CL on the 3rd of July 2011. A pity that Jochie didn't show his strong and extreme hard attacks as usual. Jochie is a social but extreme hard and difficult to train dog, Just a couple of handlers are capable of training dogs like this. The pressure on this dog was very high on the moment of certification even then hard to keep under control. Insiders will see the quality of this extreme mix Mallinois stud...BUT judge for yourself...Congratulations Johnny for this great job...Jochie: BRN 15819"
Politiehond I (Police Dog I) is the basic program in KNPV. The starting point in training a dog in KNPV is PH I. It is the most popular program in Holland. In The Netherlands, starting in the early 1900's KNVP (Royal Dutch Police Dog Association) has been providing trained and titled working dogs to its police, military, rescue organizations for a fraction of what other countries charged for untitled and untrained dogs. The KNPV program is separated in three sections. Besides parts 1, 2, and 3 there are two parts of "general outlook", one for the dog and one for the handler. There is also the opportunity to do the "additional exercise". We hope here to provide you with some information of the KNVP's most popular trial, the Keurinsstaat Politiehond One, or PH I. The PH I has 800-1,000 competitors annually. There are three levels of certificates available. Each level requires a certain score. These are: PH I Certificate A, this means that the dog achieved a score of 305 out of a possible 435. This certificate is good for a one-year period. The next certificate level is titled PH I Certificate and is good for the life of the dog. This requires 348 out of 435 possible. The final level is Certificate "Met Lof", which is good for life and means that the dog was exceptional, achieving a score of 392 points or more out of 435. The majority of dogs usually earn the standard PH I Certificate. Fewer obtain the higher Met Lof score and fewer still obtain the lower score of Certificate A. Trials are offered at local clubs at the provisional level three times a year. The following is a breakdown of how the points are accomplished, followed by a brief description of the trials and the reasons why they are done. Category 1 relates to the dog's basic obedience and control. The heeling course, both on and off leash, calls for the dog to switch from the handler's right to the left side and from the left to the right side at the command of the judge. The course involves right and left turns, stops and about turns similar to basic obedience routines. The heeling is not as precise as it is in Schutzhund, AKC or USPCA trials, but is somewhat loose. The literal translation of the exercise is to "follow on a line". The main objective here is to follow. Few points are lost in this phase regardless of precision. The bicycle heeling is an extension of the walking phase. The food refusal is rather unique in that a full suited decoy places or throws food in front of the dog. This exercise requires a great deal of self-control and restraint on the part of the dog because it is the only exercise in which the decoy is not presented as a target for attack. The exercise requires that the dog not taste, touch or smell the food. He must stay and not attack the decoy. The agility is similar to the agility found in French and Belgian Ring Sports. The dog clears the obstacle, stays and waits for the command to return, and then returns and finishes. Another exercise in the first offering needing comment is the article search. It is a practical exercise designed to be used by the police in the field. It is used to recover evidence of a crime or stolen property. The dog is given 10 minutes to search a grass area 14 x 14 meters for three small objects. The dog is graded according to the intensity of his search, the manner in which he searches and the quality of his retrieve. 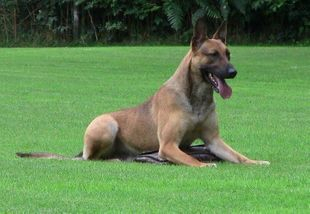 The dog is also scored on how he returns the object to his handler and his finish. The handler is allowed a maximum of five commands to successfully complete this exercise. The final exercise of the first offering in most trials is the "Stil zijn" or "Be quiet" temperament test of sorts. This exercise requires that the dog and handler stay in the woods while a 9mm pistol is fired. The dog must not bark for maximum points. A. Swim across a canal 15 meters wide. B. Swim and retrieve a large object. Since Holland is a low and wet country divided by thousands of canals, it is only normal for an exercise of this type to be included in a police dog trial. The exercise is very practical, especially the portion where the dog is required to retrieve a large object. In the case of the object it is ordinarily a 1 meter long log, 2 to 3 centimeters in diameter. This too, is useful in the recovery of evidence. In the specialized KNPV for the certificate Rerddingshond or Rescue Dog, the object is a mannequin representing a drowning person. The value of this exercise speaks for itself. During the swimming phases, the dog is scored according to the manner in which he swims. That is, how fast and how straight in a line he swims to cross the canal. He is also scored on his obedience to his handler's commands. The same applies to the dog retrieval of the log. Once retrieved, the dog must drag it up to the handler and finish. Category III is the heart of KNPV PH I, it is the part where the decoy and the dog become warriors. In the attack phases, the dog is started 110 meters away from the decoy. When the dog is 30 meters away after reaching speeds of between 32 and 53 miles per hour, the decoy then charges. The two impact. The sound of the impact is similar to the sound of two football helmets coming together. The end result is usually the same. In championship trials the dogs usually win. Several of the top decoys are carted off to area hospitals for treatment of injuries. During Category III, there are three attacks. The first involves a decoy with a rather long stick, 3 1/2 to 5 feet in length. The handler must yell, "Halt, police" three times before sending the dog. The decoy flees and then turns and charges the dog. Unlike some dog sports involving the stick, in KNPV the decoy's intention is to run off the dog. After the attack, the decoy fights the dog and then attempts to out the dog using the out command. The dog is scored according to whether or not he responds to the decoys command. The dog then releases from the bite, guards and barks until the handler walks over and searches the decoy. The handler and dog then transport the "prisoner". The second attack involves the dog pursuing a fleeing bicyclist. Once the dog apprehends the bicyclist, the dog is commanded to out. After the out and search the handler and dog begin the transport. During the transport, the decoy attacks the handler, the dog is graded according to his defense of his handler. He then is commanded to out and guard the decoy. The final attack involves the pursuit and attack of a man who has fired several shots at the handler. This attack is from 110 meters. The decoy runs with a bag of pipes, turns and fires several shots at the handler. The dog must pursue and apprehend the decoy. Following the apprehension and attack the decoy opens the bag and grabs these pipes (plastic or aluminum) and strikes the dog with them. The dog is graded according to his courage or firmness. The handler arrives, outs the dog, commands the dog to bark/guard, and collects up the gun, bag, and pipes. He then transports the decoy. During this transport, the handler is assaulted by the decoy. As before, the dog is graded according to his defense of his handler. Also offered during the third phase are a large article search in a wooded area, a search for a man in the woods, a transport of an intoxicated subject who drops a pipe that the dog must retrieve, and a recall or call-off during an attack. The article search for the large object usually requires that the dog search and locate a chair, wooden box, or bicycle in the woods. Once located, the dog must bark and not bite the object. The same rules apply to the search for the man in the woods. The final phase of testing is the recall. In this exercise the dog is sent after a fleeing decoy. Within 50 meters of the decoy the handler recalls the dog. The dog is scored according to the manner of his pursuit, the precision of his recall, and the speed at which he returns. From the description of the PH I trial it should be obvious that the trial is both complex and demanding. It is usually very fast paced.